The 2008 ASM @ Malaysia tournament offers a truly unique opportunity for you to participate as corporate teams with your VIP guests in a professional sporting event, an experience that presents numerous corporate sponsorship opportunities at several levels guaranteeing excellent exposure in the Asian region and also internationally. 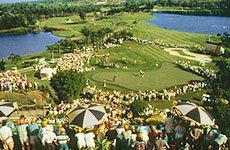 Affordable priced sponsorship packages have been created to ensure corporate sponsors the opportunity of participating fully in all aspects of the tournament and if required can create a sponsorship package at any level of value that is suitable to the sponsor's needs so as to maximize your organisation's investment. Individual places on an ASM Pro-Am can be purchased, subject to availability. Please click here if you wish to enter the 2008 ASM Open Pro-Am Qualifier.